My family stayed here during New Year's week and we absolutely loved the place. Everything from check in to check out was great. Very clean, probably the cleanest I've stayed in, and I've been coming down multiple times a year for the past 8 years. The kitchen had every detail covered, as well as the entire place was updated. I would definitely recommended and will be staying again. We LOVED staying at Rippling Waters! We could hear and see the river, felt secluded - yet were only minutes from Pigeon Forge! This was one of the nicest cabins we have ever stayed at - well stocked kitchen, comfy beds, tv's in both bedrooms as well as the living room. Also loved that I could pull underneath and have my car covered and the nice, level parking area. I would definitely recommend this cabin to friends and family. Very cute house. No problems. Would stay again! Had a few issues with the fireplace, but after i reported the issue, maintenance responded promptly and courteously. The placewas fantastic. Very clean, very comfortable, very convenient to pigeon forge. I highly recommend this place and cabins USA !! We loved this property. It was very clean and well appointed. The express check-in and check-out was a great time saver. 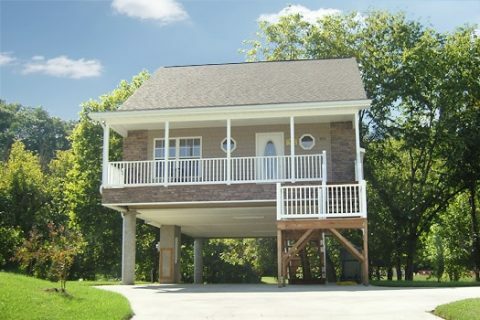 This cabin is conveniently located close to Pigeon Forge attractions but still in a beautiful setting along the river. We would definitely stay here again! We enjoyed our stay. Very nice cabin and location. My wife and I visit Pigeon Forge 2 to 3 weeks per year. We have used Cabin USA the last two or three years to get a place to stay. We ate very pleased with the service we received from the staff. The places we rented were real nice. Had problem with one of the rental but the staff took care of the problem. Ripping waters is the best vacation rental we have had. The location was great. We have a rental in Oct. in the same resort but which we could swap it out for Rippiling waters if it is avilable for the same price as the on I rented. Thanks for the service you provided. There were many fine points to this property. 1. Extremely clean. 2. Wonderful decor and appliances (high end quality). 3. Comfortable beds with beautiful bedding. 4. Each bedroom had a better than average bathroom. 5. Deck out back had a fantastic view of the creek. 6. Well maintained, quiet neighborhood. 7. Large tv's. 8. Great space for grilling. We were very pleased, and will definitely rent again. Rippling waters was a great place to stay .It is close to town and it is a very pretty place. My husband and family loved being so close to the river in the afternoon we would stand on the back porch and look down at the fish in the river I will definitely be coming back to rippling waters. We could not say enough good things about Rippling Waters! Convenient location, quietness, reasonable price ... we enjoyed it so much that we actually wanted to stay an additional night! We will definitely recommend this rental to our family and friends and will be returning in the future. Office staff was extremely helpful. We did have to check back with him re: express check-in. It was a great stay except for the weather. We loved the cabin and the great location. I would recommend this cabin to everyone and also using Cabins USA to book your vacation stay while in the Smokies. This is our 2d stay with Cabins USA. Had a wonderful time. It was quiet and close to the places we like to go to. We will be back next year! Very clean quiet and inexpensive for a first time trip. Would be nice if there was a packet of things to do and see in the area. I would like to return and use the same cabin. We had a wonderful time at Rippling Waters. It was exactly as advertised. Had everything we wanted and more! We will definitely be back! This is my first time staying at Rippling Waters. I loved it! I will stay here again. The only little problem was the garbage from the previous renters was never picked up, so when we went to throw our garbage away the night before check out, we had to call customer service. They did come empty the trash so all was good. The ceiling fan on the deck could use a light cover. I only mention this because you wanted the truth. Overall it was great and we felt completely safe. Loved it. We enjoyed our stay at "Rippling Waters". We stayed 7 nights and used your cabin as our headquarters. After a day of shopping and exploring the country side(Cade's Cove, Tanger Shopping, Newport, Walland, Cosby, Seymour, and on and on), it was very relaxing to come back to a cabin on the river, quiet and caim. We were ready to go the next morning. Will very likely come again-----maybe in the Fall. I am so happy to hear that you enjoyed your stay in Rippling Waters! We here at Cabins USA work hard to make sure each of our guests have the best stay possible while vacationing in the Smokies. When you are ready to stay with us again, please mention you are a return guest for an additional discount. Thank you for choosing Cabins USA and we look forward to having you as our guest again! Wonderful facility. Clean , quiet, with excellent accommodations. Really enjoyed our stay.